Have a plant problem? We’re here to help. At Ground Effects we have the staff with the knowledge to answer your gardening questions, giving you garden solutions. 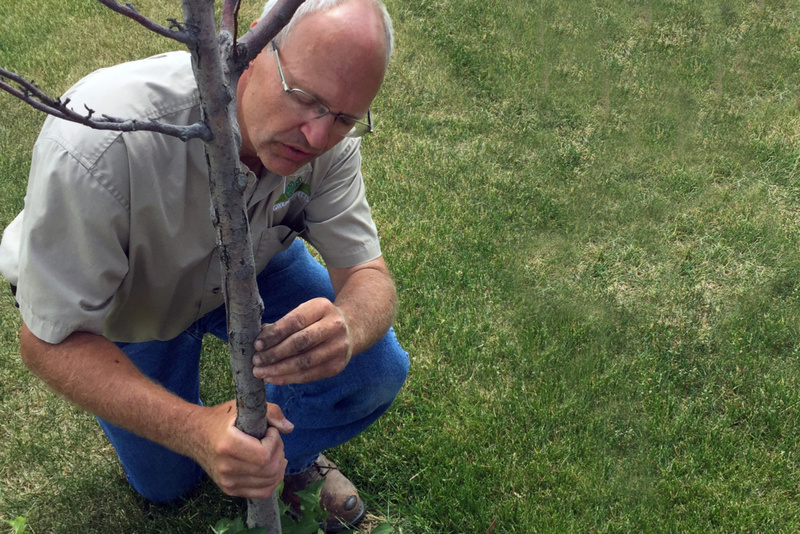 Whether you are having issues with insects, fungus, have questions about pruning or fertilizer we have the answers for you! Bring your garden, lawn and landscape questions to our wonderful staff here at Ground Effects, we’d be happy to help. If you have questions please call 712.772.4600 or email us at info@scgroundeffects.com. Terry inspecting a tree trunk. Evergreen Canker – Symptoms include areas on evergreen bark that are seeping with a abundance of white, sticky resin. For more information and photographs click here. Evergreen Needle Cast – Symptoms include browning or purpling of evergreen needles, these needles eventually drop from the tree resulting in bare patches. For more information and photographs click here. Needle Scale – Symptoms of these insects may include yellowing or wilting of leaves, stunting or sickly appearance of the plants. For more information click here. Over Watering – Over watering can occur with any plant: trees, shrubs, perennials and annuals. Over watering plants is one of the biggest issues we see as a company. When your plants don’t look healthy it is tempting to give them more water, but before you water, check the current soil moisture. This can be done with a moisture tester or by using your finger. Dig down a few inches into the soil near the root ball of the plant to check moisture before you water again. This mistake is not easy to diagnose because in many instances too much water mimics the signs of too little water. Read this article for 6 Signs You Are Over Watering. Spider Mites – Heavy mite infestations can turn the foliage from greenish-yellow and eventually tan or brown. Heavily infested plants often drop their leaves. Examination of infested foliage may reveal very fine webbing produced by the mites. Learn more from Iowa State University. Are you interested in minimizing the work you do to maintain your landscape? If you answered yes, let our maintenance department help you! Our maintenance crews have the experience and the expertise to help you maintain your landscape. Many plant diseases or pest infestations can be prevented or quickly treated with regular maintenance. Plus, our maintenance program won’t cost you an arm and a leg! Interested? Find out more today! Not all plant problems are caused by insects or diseases. Plant nutrient deficiencies often occur as foliage discoloration. Check out this article for helpful hints. If you're having problems with nutrient deficiencies, think about signing up for our fertilization programs! It is often hard to know what and when to prune your shrubs and trees, follow this visual guide provided by Better Homes & Gardens to give you a better idea of when and what to trim.